Recorded at Chipping Studio, Oxon except B4, B5 recorded at Courtyard Studio, Oxon. Side one label lists track A5 as "Thinkin About You", omitting the "G" from the song title as referenced on the sleeve. 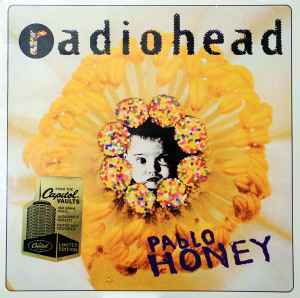 How many people only bought this record to finish their Radiohead discography? My copy has the clean version of Creep too. Unfortunately the A side is full of crackles, it's very noticeable on the not-too-loud parts of Creep, which is almost unplayable. Kinda strange, but my copy has it too. I believe all vinyl reissues contain "creep" (edited version) on side B.
I got creep on both sides too, but not too annoying, I'm OK with it, great mastering indeed =) ! Anyone else out there with a copy of this record where creep plays again on the B-side? I must have got a messed up print?